Amanda had us start with sorting our scraps by color. I already had a color sorting system in place so I got to skip straight to the piecing part. In the past I have done several charm swaps where I recievied some adorable novelty prints, but the problem is that it is was very hard for me to use those prints because they had so many colors in them and none of them matched. I asked Amanda for her opinion on what to do with them and she suggested that rather than cut them up, use them as the center block with scrappy color complementing log cabin/courthouse step piecing surrounding them. I took a charm square, picked 3-5 colors from that print, and used those colors to determine what scraps to use for the outer strips. Each square was unique and worked for that center print. I was scared that they would not look good together, and almost backed out about 4 squares in. As I kept going and kept adding different values, prints, colors, my little collection started looking more scrappy and sort of put together. I currently have 13 blocks but am going to be making at least 3 more. I have enough to make it a 5x5 if I really wanted to, we will see.... 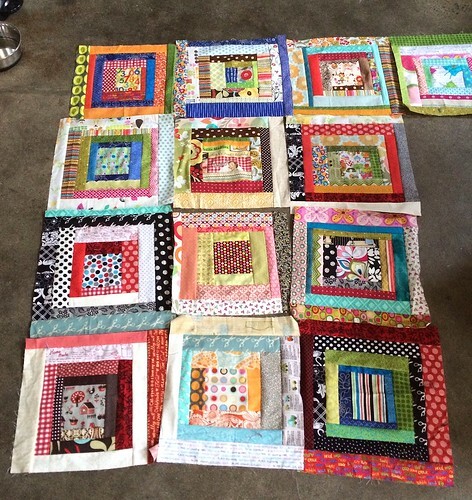 Most of the blocks are between 14"-16" and so in some way I will need to either square them all or add extra borders/sashing to get them into an actual top. 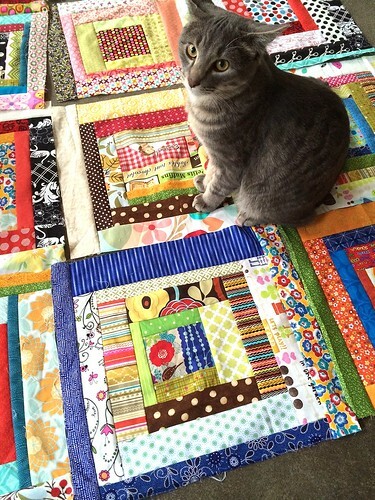 I think I might opt for scrappy sashing-like piecing to even out the rows. This is where I need your opinion. 1. 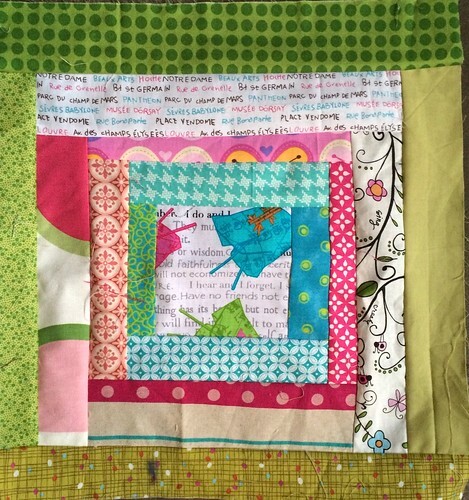 Square up blocks and piece blocks together without sashing and/or border? 3. 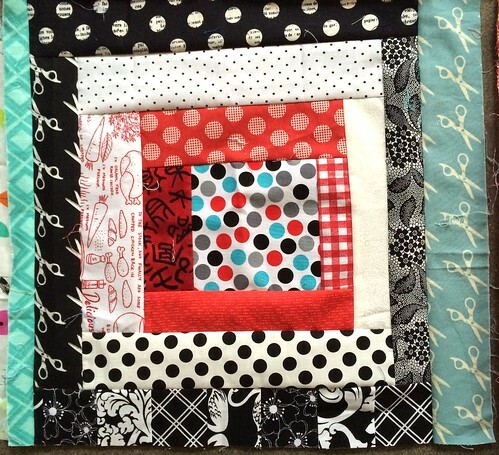 Square up blocks and use solid sashing/border? I am stalling on making the rest because I don't know where it is going. I know that's a bad excuse but it's hard for me to just make blocks to make blocks, I like to know what the finish line looks like, so please help me figure out what that is so I can continue! 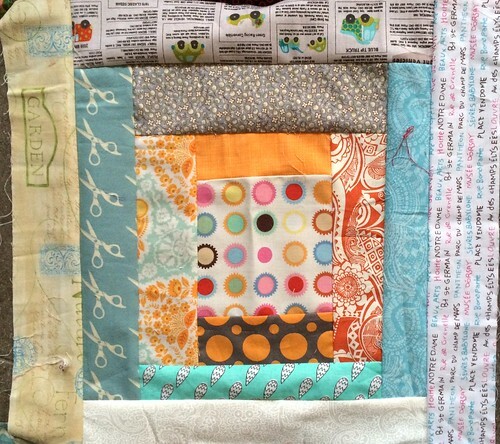 Linking up to WIP Wednesday, Sew Fresh Quilts, Blossom Heart Quilts! If you're thinking about sashing, you could lay out jelly roll strips in both solids and prints to get a better idea of where each idea might go. I think no sashing would look great with the scrappy log cabins, but scrappy sashing could increase the size for you. 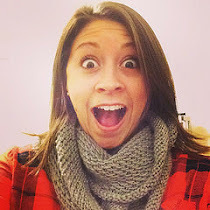 Can't wait to see what you do! I say keep going! Make the rest of the blocks, square up and join them! No sashing needed! Looks awesome. My two cents...if you put sashing between them it will separate the scrappy feel and become less scrappy. I'd add smidgens here and there to allow for them to be put together and go without a border. Everyone's got an opinion and this one is just mine. Oh I'm jealous. I'd love to take a class with Amanda. I'm not much of a sashing girl myself but you have to go with what feels best for you. I think it's looking good. Great use of the novelty prints in the center of the blocks - they look great! I am personally a fan of trimming to size and putting it together without a sashing, but if a sashing feels good to use I'd go really scrappy! 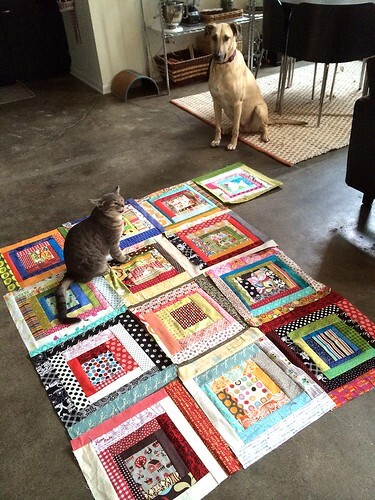 Fun colorful blocks and oh what a cute pic with your furries! i think you need to decide what size you are wanting. if you want it bigger than you have blocks for then add sashing. with busy blocks i like a solid sashing and maybe a scrappy binding. there is no wrong way to do it... go with what you like!! i think your blocks look so fun and work together nicely!!! I would go no sashing also. I think the blocks look awesome close up in the pictures. Hi Colby! Your blocks look fantastic! If it was me... I would square up blocks and piece blocks together without sashing and/or border. Your fur buddies seem to agree! I'd like to see a pic with white smashing and different colored cornerstones before I decide! I love the pic with your pets!